What happens when the parents of migrants age and need care in mobile and aging societies? Ethnomorality of Care acts as a window in sharing how physical distance challenges family-centered elderly care by juxtaposing transnational families with non-migrant families. A novel approach that explores intentions and moral beliefs concerning elderly care alongside practical care arrangements, Ethnomorality of Care presents a concept of care which recognizes how various factors shape the experience of care, including: national, regional, and local contexts, economic inequalities, gender, care and migration regimes. 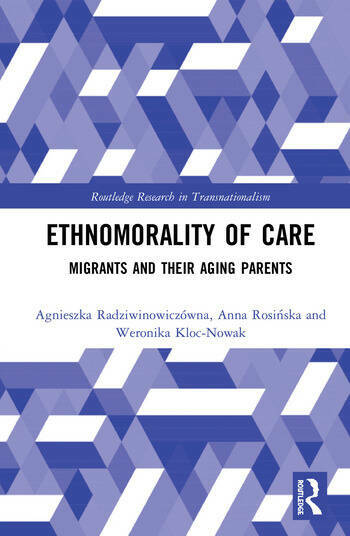 Based on the findings of a multi-sited research carried out between 2014 and 2017 in Poland and the UK, this perceptive volume also seeks to demonstrate how researchers and practitioners can use ethnomorality of care approach to examine non-migrant families and other types of care. Helping readers to better understand the lived experience of care receivers and givers beyond kinship care, Ethnomorality of Care will appeal to graduate students, researchers, policy makers and care practitioners interested in fields such as migration studies, transnational studies and social and cultural gerontology.